As the wife of Dr. Blaney, I am happy to say that we live and work together well. My responsibility is to manage the practice. I am in charge of handling the accounts receivable and pay the bills. If a patient is in need of financial arrangement I am the one to see. I have worked with many patients’ finances so that they were able to achieve the dental health that they needed. Terri received her Associate’s of Applied Science Degree in Dental Hygiene in St. Louis, Missouri. She has been working in the dental hygiene field for over 16 years, primarily in general dentistry practices. Her experience also includes serving in clinics for underprivileged patients and working in a practice which specialized in pediatric dentistry, with an emphasis on special needs children. She has attended over 150 hours of seminars and continuing education programs and is certified in anesthesia administration and CPR. 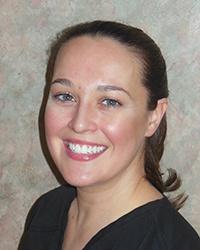 Terri has been a member of Dr. Blaney’s staff since 2001 and has earned the confidence of many patients. She is friendly and patient and combines skilled professional care with practical suggestions and encouragement, to provide each patient with a pleasant experience and optimal dental health. 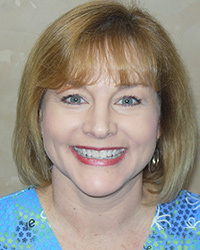 Terri is proud to be a member of Dr. Blaney’s staff and enjoys the friendly, family atmosphere in the practice. She is also thankful to be a part of a practice where the staff takes a moment to pray together for the needs of their patients. Jeannie Claus has worked as a secretary, sales support coordinator and office manager over the last 30 years. She has known Dr. Blaney her whole life because she is his sister. 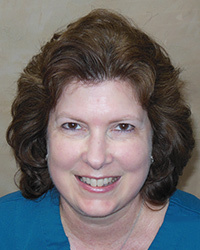 Jeannie joined Dr. Blaney’s office in 2010 upon the retirement of Liz Sherlag, her predecessor. Jeannie likes to relate that when Dr. Blaney realized he needed to find a new secretary he told Jeannie that he was praying she’d take the position. Who could turn down an offer like that? In the three years that Jeannie has been working here she has discovered a wonderful community of wonderful established and new patients; as well as a competent, friendly staff that is a pleasure to work with. In her spare time, Jeannie enjoys spending time with her husband, four children and three grandchildren. One of her favorite destinations on days off is White Pines State Park which boasts great hiking trails.